Whether you're trying to achieve 100 percent completion, or you just need help unlocking a specific weapon, these Just Cause 3 cheats for PlayStation 4 will aid you in your fight for justice. Rebel drop beacons are generally found in liberated areas and near garages. Their locations are represented by download icons on the map. You must complete all daredevil jumps in Insula Striate to unlock the monster truck in the rebel drop menu. One can also be obtained from the Incendiario Blast challenge if you exit the challenge before you blow up. You can view the wreckage of the Mile High Club blimp from Just Cause 2 by flying over N 40 48.982 / E 5 36.629 in Maestrale. Thor's hammer can be found in a crater at N 40 48.566 / E 5 40.859 in Grande Pastura, but it can't be picked up. Make sure to disable the airstrike FOW during act 1. If successful, you can see "The Rocket" soap box car at N 40 41.756 / E 5 43.986 in Insula Fonte. You can find the Buster Sword from Final Fantasy VII sticking out of a rock at N 40 48.277, E 5 43.363 in Insula Striate, but you can't collect it. Finish the main campaign or collect every Di Ravello tape. Collect every vintage part in Insula Dracon. Complete every daredevil jump in Insula Forte. Complete every daredevil jump in Insula Dracon. Fast Travel Activate every rebel shrine. Fire Leech (Rocket Launcher) Liberate Cava Geminos Nord. Incendario Monster Truck (Off-Road Vehicle) Complete every daredevil jump in Insula Striate. Find every vintage part in the game. Cavouk U-15 (Motorcycle) Liberate Cava Grande Secunde. Stria Facocero (Military Car) Liberate Porto Le Gratia. Find every vintage part in Insula Fonte. UVK-13 (Rocket Launcher) Liberate Vigilator Sud. Locate a puppy at N 40 43.371 / E 5 37.057 in Insula Dracon. Climb atop the building at N 40 42.592 / E 5 35.105 in Insula Dracon, then jump across to the adjacent rock face to find it. Found on top of the skyscraper at N 40 44.316 / E 5 38.710 in Citate Di Ravellos. Destroy every chaos object in a military base without the use of weapons or explosives. Get at 3 gears or greater in at least one challenge of each type. Beat a score you were called out on. Beat someone else's score in any challenge. Call out someone else in a feat. Find every vehicle and bring them to Mario's Rebel Garages. Drive a land vehicle off of every daredevil jump location. Find all of Di Ravello's tapes. Unlock one of each vehicle type in the rebel drop menu. Finish the story mission "Welcome Home." F!#& You Missle! Finish the story mission "Missile Cowboy." Finally on the Offensive Finish the story mission "Tangled Up In Blue." Hide in a monastery to clear heat level 5. Earn 3 gears in any challenge. Liberate the entirety of Insula Striate. Liberate the entirety of Insula Fonte. Mistakes and Triumphs Finish the story mission "The Shatterer of Worlds." Unlock and activate your first Gear MOD. Unlock all gear MODs in one category. Keep every gear MOD active for at least 1 minute. Adeo, amico! My Little Rocket Man Tether an enemy to a gas canister being launched. Find every collectible in the game. Find all vintage weapons and vehicle parts. Light candles in each rebel shrine. Son of Medici Finish story mission "Son of Medici." Disarm the FOW in Insula Fonte. Liberate the entirety of Insula Dracon. Finish the story mission "A Long and Dangerous Road." Finish the story mission "The Great Escape." Destroy all chaos objects in a military base without getting out of your vehicle. Pay respects at each ancient tomb. Top of the World Stand atop the highest point in Medici at N 40 48.085, E 5 43.220 in Montana. Unlocked and Fully Loaded Unlock all weapons and vehicles in the rebel drop menu. Finish story mission "A Terrible Reaction." 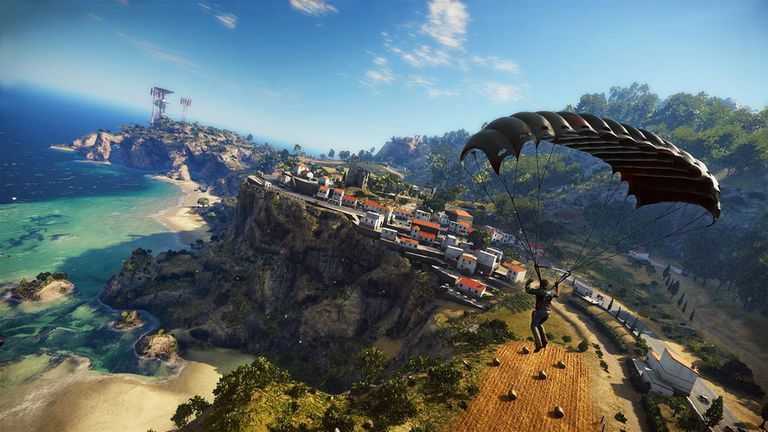 Achieve 100 percent completion in Just Cause 3. Plant a booster explosive on an enemy to send them flying. You've Got Gear Earn 5 gears in a challenge. While the PC version of Just Cause 3 allows you to add mods that make Rico invincible or grant similar god-like abilities, the PS4 version doesn't support such mods.